- Chrome Moly steel tube fuselage. - Fuel was gravity fed from fuselage tank. - Fuel in wing tanks was transfered to fuselage tank with a hand wobble pump. and bank and rate of climb indicators were offered as options. - A 2 cubic foot baggage compartment with a 10 pound weight allowance. - Detachable motor mount allowed different powerplants to be accomodated. The Model X was the first of the Sportsters. Painted Black & White seperated by an Orange Pin Stripe. An "8 Ball" addorned the side, consisting of an orange background with a large black number 8. Lowell Bayles flew the model X to Second place in the All American Air Derby. Sponsored by American Cirrus, the contest required the use of a Cirrus engine. The winner was the aircraft/pilot with the lowest accumulated time for the 12 legs. The course stretched roughly from Detroit to New York to Texas to Los Angeles and back to Detroit. The route resulted in 5,635 sm of flying, with 12 days of flying and a 1 day layover in Los Angeles. 18 aircraft started out on July 21, 1930. 10 aircraft completed the race, arriving back in Detroit on August 1, 1930. The Model X was forced down three times between Utah and Nebraska by engine trouble. Lowell Bayles was able to complete the race by temporarily securing a loose rocker arm bracket using bailing wire. 1st place: Lee Gehlback in Command-aire "Little Rocket" 43 hr, 35 min, 30 sec elapsed (127.1 mph) $15,000 prize plus $5000 in segmet wins. 2nd place: Lowell Bayles in the Gee Bee Model X: 47 hours, 36 min, 8 secs, (116.4 mph avg speed) $7000 prize. 3rd Place- Charles Meyers in a Great Lakes - 51 hours 34 min 31 secs (107.3 mph average speed) $3000 prize. Lowel Bayles purchased the model X after the race with his share of the purse. In early 1931 Lowell Bayles flew his model X as the main attraction for the "Brinton's Flying Circus" which consisted of 4 planes, 6 pilots, 1 truck driver and a truck with a speaker system. The circus toured from North Carolina southward. This aircraft was later converted to the model F configuration by installing a 135 hp Fairchild 6-390. NR49V was lost while stunting at the dedication of Cromwell Field (Burlington, Vermont) in September of 1931. Roscoe Brinton, the pilot successfully bailed out. Harold Moon of Philidelphia purchased this ship for $4980. The model B featured a new landing gear with shocks and fairings. The cowling was also different than that of the X. It was painted two tones of brown that were seperated by a 1/2 inch red stripe, a paint scheme featured on the 1930 Packard. The aircraft was monogramed with "Myodine" which was the name of his company. On 11-15-1932 Mr. Moon sold the aircraft to Edith Bernson. Edith had the engine upgraded to a 125 HP Cirrus Ensign, at which time the fuel capacity was reduced to 30.5 gallons for weight considerations. The last report of the aircraft was a 6-3-1933 inspection report that cites 152 hours of flight time. It is rumored that airplane was sold to an overseas customer in Spain. George Rand of New York purchased this airplane. It was painted coca-cola red and white. 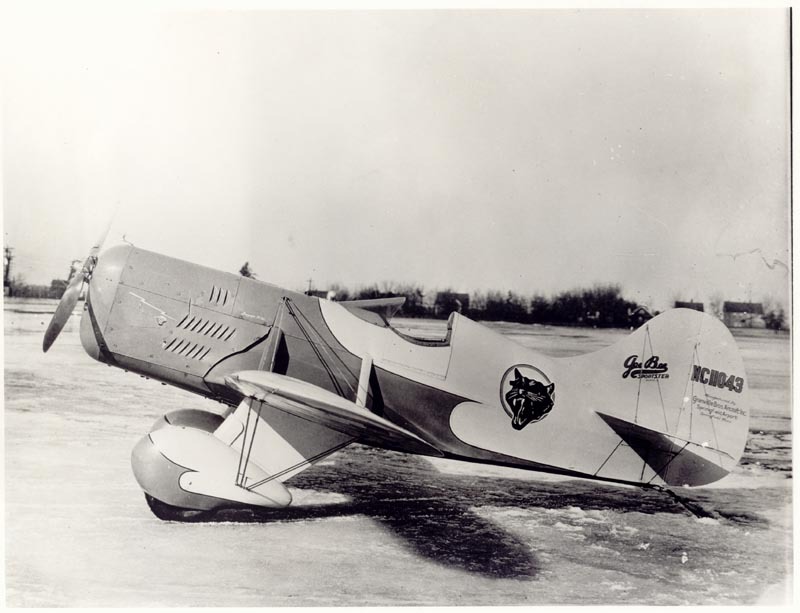 A running pirate (the menasco logo) was featured on the airplanes side. After delivery, the aircraft was returned to the factory and the larger fin and rudder developed for the Model D was installed. It is clear that the airplane was not upgraded to the Model D configuration (the 95 hp Menasco B-4 was retained and wheel pants were omitted), however the airplane was placed in the standard category on a 'on-time basis' with ATC404 as the supporting data. The aircrafts identification number was changed to NC855Y. On 10-1-1931, Mr Rand sold the airplane to Harry Hall of New York, NY for $800 and a J-5 Waco Taperwing. The airplane was destroyed in a fatal accident at Jersey City, New Jersey on 10-25-31. Zantford (Granny) Granville flew NC11043 to airshows and races in the spring of 1931. Skywriting equipment controlled by a trigger on the joystick was installed and "Gee Bee" was scrawled across the sky over Manhattan. The paint scheme was Blue & Creame separated by a red pin stripe. A panther was painted on the aft fuselage and a pirate on the cowl. The model D featured a larger vertical fin and rudder than it's predecessors and also had a fully faired landing gear. ATC404 was cancelled after the Granvilles went out of business. Bob Hall flew "the cat" to 1st place in event #4 of the 1931 National Air Races. This was a 25sm race for certified aircraft with a 400 cubic inch or smaller engine. 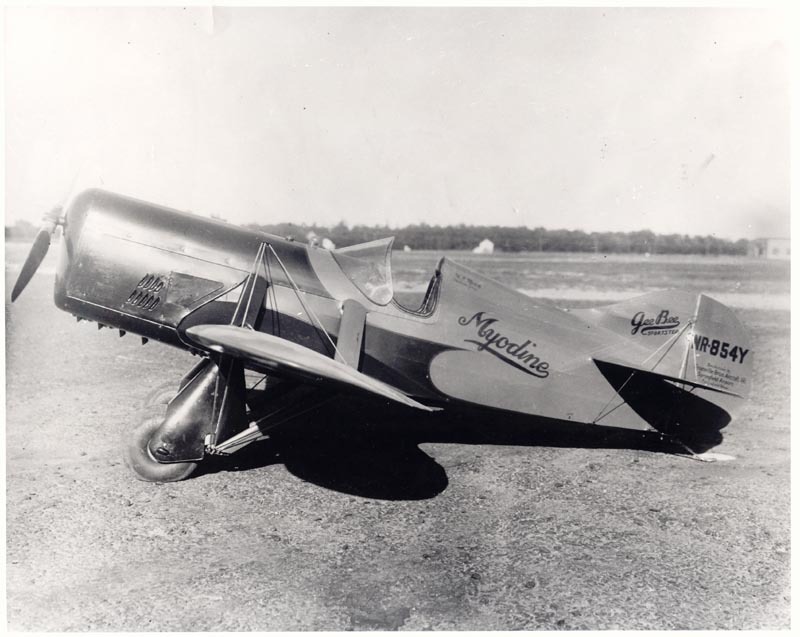 Mrs Mae Haizlip placed 2nd in two events of the 1931 National Air Races. 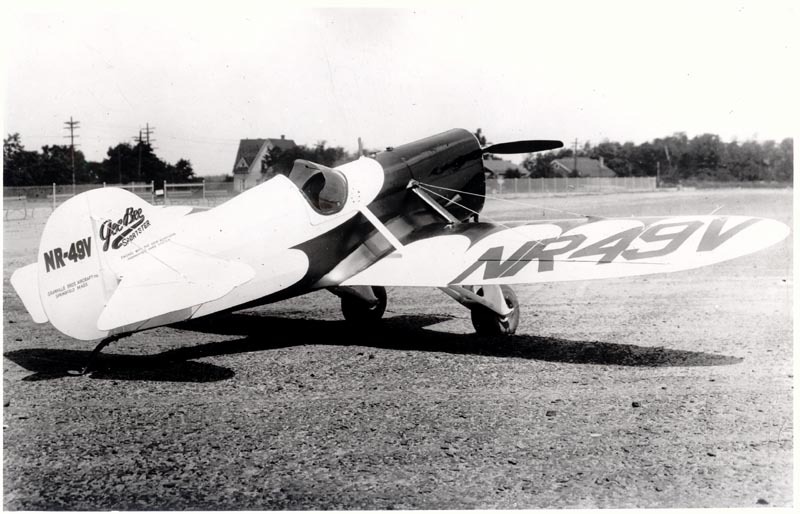 Bill Rausch raced this airplane in the 1932 Nationals. NC11043 was lost in 1935. Al Nott flew this model E to Miami, Florida in Jaunary 1932 to participate in the All American Air Races. He earned 6th place in the green trophy race and 1st place in the Cuban Trophy race (132.58 mph). In February 1932, when returning to Springfield, Mass the airplane nosed over resulting in minor damage and no significant injuries. Mud packed into the wheel wells had dforzen in flight, locking the wheels in position. NC856Y with Zantford Granville piloting was lost in 1934 on landing at Spatanburg SC, while maneuvering to miss men and equipment that were working on the runway. The model E was completed for the Harris/Tibert company of Los Angeles. The Harris/Tibert company intended to become a Gee Bee distributor. Enroute to the west coast they attended a February 14, 1931 airshow at Chandler Field Atlanta. While performing in the show the model E spun into the ground. This Green and White model E, originally built for Bill Sloan was returned to the factory for use in the Ford Air Tour. She wore race #14 and the Granville twin greese logo. It was flown in the 1931 Air Tour by Lowell Bayles. A mid race engine change cost the team a 5% penalty. Lowell Bayles and the Model E finished 4th in points and was declared the winner because the two Fords that finished ahead were inelgible and Schneider who also finished ahead had failed to complete two legs. Lowell Bayles also flew this aircraft to the eastern states expo in 1931. Zantford flew NC46V to Santa Monica, CA to participate in the 1931 on-to-Cleveland Derby, a 2,400 sm race. Kidney stones forced Zantford to drop out of the race. Maude Tait placed 3rd in two events of the 1931 National Air Races while flying a Model E.
NC46V was lost shortly after takeoff on August 20, 1932. The pilot was Russell Boardman who had no prior experience in the E, although he had flown the more powerful model Y. Witnesses said the pilot tried to pull the airplane up into a loop from takeoff. He didnt make it and crashed in the brush on the airport. Completed in August of 1931, this ship was delivered to Sloan to replace NC46V which was borrowed for the air tour. NC72V was painted yellow and green. Sloan flew her 990 hours in 4 years before the lingering depression forced a sale. Don Walters then flew this airplane in Bell Sweet's Air Shows. He hist a truck on the runway while landing. The Granvilles then rebuilt the airplane. It later crashed again when the engine quit and the plane hit a fence during rollout. Walters who was piloting the airplane survived. The wing of this airplane is on display in the EAA museum. That wing wears the coca-cola red and white Gee Bee colors.